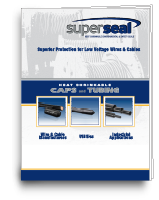 Super Seal End Seal Caps provide wire and cable with superior environmental protection against damage and moisture. The patented material formulation provides high quality sealing protection for most cable jacket material including XLPE, PVC, PILC and Rubber. Super Seal Caps are utilized across many industries including wire and cable manufacturers, utilities, industrial users and OEM’s. They are available in a full range of sizes from 1/4" through 19½" diameters; available with and without valves for external pressurization. Cleaned wire/cable prior to placing properly sized cap over cable end. Apply heat evenly from heat gun or propane torch. Shrink the closed end of cap first continuing to apply heat to the cap moving towards the open end, until the entire cap is firmly fitted to the cable. Sealant will flow from the open end. Allow cap to cool. Prepare cable by selecting appropriate size cap making sure both are clean prior to application. Place end seal cap over the cable end and apply heat evenly moving towards open end. After Heat has been applied the end cap shrinks to the cable creating a durable protective seal.